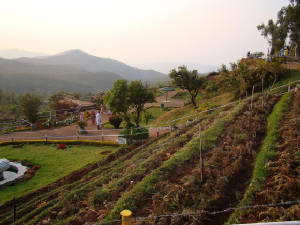 Kemmannugundi is a beautiful hillstation to visit in Tarikere taluk, Chikmaglur district. 'Kemmannu' means 'red soil' and 'gundi' means 'pit' or 'hole'. This was the summer palace of Krishna raja wodeyar. Raj Bhavan and Z point are the two places where you can enjoy the sunset. There is a rose garden in RajBhavan. You can book the rooms at RajBhavan which will be a good place to stay. Otherwise you will get rooms just below the top. Hebbe falls is another main attraction 8 km away from the rajbhavan where you can reach by mahindra jeep which are available at kemmannugundi. They will charge around 700 rs per trip which is worth giving. Even you can go by bike.But if you are lucky enough, then only you will reach back without any problem. (Tough road). The falls is too good and one should not miss that. 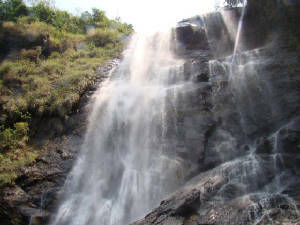 kallathi falls is another falls of around 120 metres height nearby kemmannugundi which you can cover. Roads are good either ways.We reached Kemmannugundi on 7th march 2009 via Arsikere and came back on the next day via Chikmaglur, Hassan.